Iranian culture and society holds a rich history tracing all the way back to 550 B.C. and the beginning of the once-mighty Persian Empire, one of the largest in human history. Its vast rule expanded from the Mediterranean Sea in the west to India in the east, a dynasty that promoted revolutionary social reform and the first declaration of human rights of its kind. The cultural landscape of ancient Iran was profound in its artistic endeavors, serving as a cornerstone for poetry, philosophy, literature, painting, calligraphy, music, craftwork, and architecture. However, Iranian culture has endured transformative influences from a violent history of conquering powers that aimed to influence and distort existing values and beliefs. Language and tradition was inevitably infused with these external influences, but internal resistance remained at the core of Iranian consciousness. This mentality of resistance has taken root in the people of Iran, and has manifested itself throughout multiple periods of political turmoil and regime change, most notably during Iran’s 20th century revolutionary conflicts against U.S. imperialism. In 1953, the U.S. Central Intelligence Agency, in collaboration with British intelligence, conducted a military coup d’etat that overthrew Prime Minister Mohammad Mosaddeq after he declared that he would nationalize Iranian oil. This would have severely threatened Western economic interests due to the global reliance on Middle Eastern oil exports, thus prompting the U.S. to intervene and install a pro-Western monarchy that would rule until a major revolution just two decades later. The Iranian monarchy did what it was intended to do, protect Western interests and quell nationalist uprisings that would threaten the existing power dynamic, until popular unrest again aided by U.S. forces led to the collapse of the monarchy in 1979 and the establishment of an Islamic republic. As a dialectic pushback to this new oppressive regime, resistance began to take shape as a recurring motif throughout Iranian art, particularly in the cinematic realm. Zara Knox of REORIENT Magazine illuminates, “Iranian cinema has long served as a mirror, reflecting a nation that has absorbed foreign influences, defied restrictions, and expressed hope for its future, all the while proudly drawing upon its own ideologies and deeply-rooted tradition of storytelling”. Contemporary Iranian film has gained prestigious acclaim by film critics worldwide, boasting over a dozen Academy Award nominations in various categories and two Best Foreign Language Film victories, with even greater praise achieved in international festivals. Directors such as Massoud Kimiai, Asghar Farhadi, and Jafar Panahi helped foster the Iranian New Wave, emphasizing a new way of thinking that diverged from the bourgeois consumerist culture surrounding film entertainment before it embarked on its revolutionary twist. Iranian films explored more provocative themes that challenged the political status quo and portrayed brutally realistic depictions of everyday life in the outskirts of the main capital city where people often lived differently. In Kamran Shirdel’s 1963 film Tehran Payetakht-e Iran Ast (Tehran is the Capital of Iran), he aims to “reveal the disparity between Iran’s celebrated wealth and its deprived reality”. The narrative strings throughout Iranian post-revolutionary cinema reflected economic hardships and massive inequality, the dichotomy of religion doctrine being used as a political tool, the longstanding spiritual and physical turmoil of war, breaking conformity with historical gender norms, and fighting government censorship that permeated every aspect of society. There was a renewed focus on social realism, contextualizing the lives of ordinary Iranians under the regime and expanding the ideological boundaries of an often misunderstood and misrepresented nation through the lens of Western mass media. Political turmoil is often able to cultivate revolutionary artistic movements. Out of hardships and struggle, a creative movement toward freedom of expression and dissent is birthed. With Iran as a case study, years of imperialist Western intervention and oppression triggered a cinematic spring that swelled to groundbreaking proportions. Farhadi, an Iranian director who won the Academy Award for Best Foreign Language Film twice for A Separation (2011) and The Salesman (2016), exemplifies precisely the subdued social tensions and ideological struggles in the face of a fundamentalist regime that continues to shy away from the realities of its time. Today, with the onslaught of sanctions imposed on Iranian trade by the U.S. to the executive order that once established an unconstitutional travel ban on cherry-picked Muslim-majority countries, juxtaposed against our dangerous alliances with Iranian adversaries Saudi Arabia and Israel, the Iranian economy is in major turmoil. The ordinary people, citizens living about their daily lives, are the ones suffering the most from U.S. foreign policy. One can only expect to see a hyper-energized field of creative expression from here on out, magnified in its streak of revolutionary persistence, rooted in a deep anger towards a government that silences dissent and punishes nonconformity. As an Iranian-born immigrant to these United States, my heart will always be with my ancestral homeland and the unrelenting hope for a better future for the Iranian people. Tiffany Hunts Along belongs to the Three Affiliated Tribes, a community of the Mandan, Hidatsa and Arikara Nations now living on North Dakota’s Fort Berthold Indian Reservation. She knew the mountainside well, the beautiful hilltops and expansive fields surrounding her cherrywood mobile home where she lives with her husband and children. However, when she was asked about her official address, she was at a loss. It wasn’t until she took out her newly issued tribal identification card that she was able to name her address, a street called Medicine Otter Loop where she had been living for over a year. Unfortunately, many others in North Dakota’s indigenous communities struggled to obtain the appropriate documentation in time to cast a ballot for this past Tuesday’s midterm elections. This inequitable treatment is all thanks to a state law passed by the Republican state legislature only one month prior that rejected tribal IDs without accurate street addresses as accepted voter identification at the polls. Not only are indigenous communities bearing witness to wide-scale voter suppression, but they are also at the mercy of a continuum of attempts at perpetuating a violent colonial history of cultural erasure and assimilation. About 60% of Native Americans in North Dakota live on reservations lacking official street addresses and direct mail services, a design of the hierarchical powers responsible for inflicting a mass genocide and ethnic cleansing upon the indigenous inhabitants of these lands during their initial phases of settler encroachment. State officials claimed that the measure was meant to protect against voter fraud, but without being able to provide any evidence of past trends in voter fraud, it is glaringly evident that such a widespread disenfranchisement of Native Americans is intentional in its oppression of historically marginalized communities and culturally destructive in its implementation. The timing of this law came right at the denouement of a competitive campaign cycle for the state’s U.S. Senate race between incumbent Heidi Heitkamp and Republican challenger Kevin Cramer. Heitkamp won her seat back in 2012 by only about 3,000 votes but was unable to squeeze through this time around, losing her race by about 9 percentage points in a state that Trump carried by 36. Political ramifications aside, this issue extends far beyond mere voter suppression. The history of indigenous peoples of this nation is one of ultimate importance. Colonial exploitation and elitism helped set the foundation for this country, influencing its evolving values and so-called democratic structures that continue to oppress marginalized communities today to an irrevocable extent. It was simply not enough to have banished Native American tribes from their own lands, and after having seized their livelihood and inflicted disease and starvation, forcing them to migrate to federal reservations on foot during one of the darkest shadows cast on our history known as the Trail of Tears. Institutionalized racism and cultural erasure manifest itself differently today, yet they are still at the hands of an elite class wishing to control the status quo over minorities that may present a challenge to that structural power, with North Dakota’s voter ID law being a prime example of this process. As Chief Diversity Officer of USC’s Undergraduate Student Government, I am able to analyze the subtlety with which bureaucratic administrations perpetuate the disempowerment of such groups, most notably the lack of institutionalization for cultural student organizations that are not able to amass an arbitrary conception of a sufficient level of community engagement. How can we expect these groups, bearing the weight of multiple layers of forced oppression, to build up an organized community to advocate for their interests when they are denied those opportunities at every turn? In a manner that echoes our brutal Jim Crow past, modern voter ID laws serve to invalidate indigenous and minority identities, to further remove them as secondary or even extraneous to the American political process. In doing so, the political establishment weakens their voices and deems their identities to be inconsequential or even invisible in the eyes of the mainstream, taking a crucial step in enforcing a cultural hegemony. It wasn’t enough for this early establishment to construct American schools on Native reservations, mandating children to adapt to the Western traditions of their colonizers as memories of their own customs, languages, and stories began to fade away. The oppression of marginalized groups drastically affects the vitality of our American democracy, placing an impetus for reform on all of our shoulders. Neither major political party is in the clear. While anyone is able to easily regurgitate the same abysmally progressive rhetoric we’ve been hearing on campaign trails nationwide, the entirety of this nation will be held accountable until our government is truly reflective of diversity and equity in its composition and its legislative actions. Disenfranchisement does not solely render a citizen unable to vote for their interests to be represented in governmental affairs. The evolution of voter suppression stems from our historic narrative of colonialist brutality, and our continued self-prescribed ignorance is leading us further towards the urgency of a renewed civil rights movement. The work is never complete. In case you’ve completely detached from the cultural zeitgeist these past few months, at long last, states across the nation are about to hold midterm elections this Tuesday, November 6. Early voting has already commenced, as mail-in ballots are being counted and polling places are preparing for an election that has become nationalized as a midterm report on the Trump administration thus far. What’s up for grabs this Tuesday? There are a slurry of swing congressional seats, senate spots, governorships, and statewide ballot measures that American voters must consider. However, amidst the punditry that we’ve been hearing for months on end regarding predictions, candidate performances, and policy issue platforms, there is one aspect that often does not garner nearly enough attention given the severity of its influence in influencing our electoral process: campaign contributions made in large part by corporate PACs and wealthy donors. Democratic candidates across the country are shattering records as they head towards a hopeful blue wave, flipping swing districts in a fight to take back the House of Representatives from Republican control. Many of these candidates have pledged to reject campaign donations from corporate PACs, or political action committees created exclusively for fundraising money to donate to campaigns or spend on behalf of them, and in turn rejecting the corporate interests that come along with the donations. Corporate PACs are not to be confused with super PACs, which serve as separate independent expenditure committees that may raise and spend an unlimited amount of money for or against political candidates without giving money directly to campaigns. Corporate PACs typically involve members of a company collecting funds for a candidate, therefore rejecting these funds signifies a rejection of personal investments from the business class. From New York’s congressional candidate Alexandria Ocasio-Cortez to California’s Senator Kamala Harris, nearly 200 Democrats have promised to place the interests of communities and constituents before corporate interests. While this trend reflects a growing progressive shift in the way we view the influence of big money in politics, this is but a single step towards equalizing the playing field and pushing for major federal campaign finance reform. The unrestricted influx of dark money flowing into campaign politics is inherently dangerous and threatening to our values of equality, fairness, and transparency. The concept of “one person, one vote” fades into the abyss as a small group of wealthy elites are ultimately granted major influence in policy decisions that seriously affect us all. There are factions who argue that campaign contributions are an exercise of free speech, protected by the First Amendment, and just another function of our democracy where those who have the wealth can do with it whatever they’d like. The toxicity and volatility of this ideology cannot be emphasized enough. The same corporate donors in the vein of the Koch brothers and company wishing to influence policy outcomes in America made their money off the backs of exploited labor, poor working conditions, and historical discrimination towards marginalized communities. If the Democratic party platform truly wishes to emphasize social justice, then the party must also commit to securing economic justice as the two go hand in hand, both extremely vital in ensuring the sanctity of the other. The amount of Democrats we’ve seen speak out against the acceptance of corporate PAC money is wonderful but it is not enough, and time is a precious resource that we are drastically running low on. Unrestricted campaign contributions should not be considered free speech when it is done at the expense of the communities that have suffered immensely as a result of unbridled corporate mistreatment and exploitation. Doing so only contributes to a growing disparity between the class of interests that are being represented at the highest levels of government. That cannot be a standard of democracy that we soon come to normalize in this nation. At what point do we break away from the wheel of oppressive political hegemony and institutionalized class inequities? California has been at the forefront of a massive housing crisis for years. Unaffordable housing and inadequate support services largely contribute to the growing epidemic of homelessness impacting cities all across the state. Despite multiple attempts at policy reform and financial allocation to remedy the issue, the core of the problem for California seems to be simply attempting to treat the symptoms of chronic homelessness without abolishing its roots. There are many factors that can account for the rise of homelessness, but few are as consequential as the 1995 Costa-Hawkins Rental Housing Act which limits how cities can apply rent control. Currently in Los Angeles, rent control applies to buildings that were constructed before October 1978, leaving newer development projects at risk of rent hikes every time a tenant moves out. Costa-Hawkins helps glide this process, placing restrictions on rent control for major metropolitan cities such as Santa Monica, Beverly Hills, and West Hollywood. Los Angeles has seen its rent increase at least 3% every year since 2012, according to the U.S. Department of Housing and Urban Development. About a third of Californians spend half their income on their rent. Another 3% increase will leave an estimated 1,180 more people homeless, adding to the growing crisis being impacted by high housing costs and low household incomes. According to the U.S. Census Bureau, nearly one in five Californians live in poverty. This is unacceptable, and a gross misrepresentation of the progressive values that we claim to uphold for our communities. Prop 10 is on the ballot for California voters this November, with one of its highlights advocating for the repeal of Costa-Hawkins. The ballot initiative campaign has spent over $60 million pushing for tenant protections and relief from increasing rent hikes by instituting local standards for rent control. “In the midst of the worst housing and homeless crisis that our country has ever seen, how does a bill that restricts local government’s ability to address it go untouched?” asked Damien Goodmon, director of the Yes on 10 campaign. The time for silence on one of the state’s most pressing issues is over. No, Prop 10 will not immediately solve all of the housing problems across California’s urban areas. It may place many rental units at risk of being taken off the market by landlords in order to be converted to for-sale units, catering to higher income audiences and potentially emboldening gentrification. Despite this risk, it is imperative that local governments provide incentives and act as partners in this process so as not to intimidate landlords and development companies. Prop 10 is a crucial step towards the shared goal of all Californians to have equitable and fair housing options for all of our communities. California needs more affordable housing, about an average of 320,000 new homes per year to properly address the shortage, but construction projects are simply unable to match the required speed of working at a rate triple their current pace. Supply cannot feasibly meet the demand given our current infrastructure. Strengthening rent control will prove to be the most direct and effective protection measure for renters, providing them with the stability and confidence required to invest back in their communities. Prop 10, however, would not mandate any measures for rent control with its passage, but it would give cities and counties the authority to make those decisions for their own communities. Each city and county is different, with different populations and concerns, so we must grant each locale the freedom to decide how best to alleviate their housing crises. We must repeal Costa-Hawkins if we can ever hope to take serious action in combating homelessness in our neighborhoods. With a range of support from progressive elected officials and organizations, including tenants’ unions, advocacy groups, and workers’ coalitions, Prop 10 is galvanizing marginalized communities across the state that refuse to be taken advantage of by manipulative landlords any longer. Americans have been strapped into a brutal emotional rollercoaster ride for the past two years, reeling from an exhausting mourning period with a front-row seat to the societal decline and deterioration of democratic values under the Trump administration. Right-wing populism is on the rise, emboldened by nationalist movements in Western Europe that formed out of a place of resentment and anger sparked by a growing refugee crisis and economic downturns. Countries such as Germany and Italy are being hit hard with an influx of refugees from the Middle East, rising crime and unemployment, and dissatisfaction in the euro, leading to the steady normalization of nationalist parties across the region, a xenophobic epidemic carrying very real consequences. In the summer of 2016, voters in the United Kingdom voted to separate from the European Union in a split known as Brexit out of similar conservative economic and social fears. The prominence of populist candidates across Europe points to a shared narrative of anti-immigration frustrations that are manifesting themselves at the polling booths, from empowered far-right parties in Austria, Italy, Hungary, and Slovenia, to the near victory of Marine le Pen and her corrupt National Front party in France. The plight of contemporary populist rhetoric has now landed in Brazil under the shadow of Jair Bolsonaro, a polarizing Presidential candidate who promises to “break the system” with an array of hardline conservative policies that evoke a return to the nation’s brutal authoritarian past. With 46% of the vote from the first round of elections, Bolsonaro won popular support by tapping into a deep well of resentment over corruption scandals and increasing crime rates contributing to the rapidly growing socioeconomic divide in Brazil. A recent Gallup poll indicates that 77% of Brazilians regard their government as being highly corrupt and are skeptical of the integrity behind the electoral system by which government officials come into power. Bolsonaro, a former army captain and 7-term legislator, has advocated for restoring Brazil to a military dictatorship, invoking an era of Brazil’s repressive political history that was responsible for brutally torturing and murdering hundreds of its dissenters. In a 2014 report by the National Truth Commission, it was also found that the United States had spent years teaching torture methods to the Brazilian military in supporting the coup. Aside from his anti-democratic ideals and deplorably sexist and racist remarks, Bolsonaro also opposes abortion rights and affirmative action initiatives created by the former Workers’ Party. On the growing issue of crime, he promises to toughen prison sentences, give police forces greater authority to kill, and make guns more accessible to obtain for civilians. He is hostile towards the press, discrediting large news organizations that do not cover him favorably, and often uses social media to reach his followers. This political zeitgeist in Brazil can’t help but trigger an unsettling deja vu for many Americans that saw the evolution of an unrefined and unqualified real estate mogul turned President of the United States. Bolsonaro and Trump share many similarities, spanning political beliefs, campaign tactics, and utilization of populist and often controversial rhetoric to bolster the forgotten masses of a nation struggling under social and economic stressors. The past two years in America exemplify the dangers that right-wing populist ideals can have on our standards of social rights, economic equity, and the demands of the working class and minority communities. Immigrant children are being detained from their families, forced to show up in court and defend themselves, some of the youngest at two years of age. Travel bans on Muslim-majority countries were enforced by executive decision, only to have the nation’s courts strike those policies down as unconstitutional. These are merely a few instances of xenophobic sentiments taking root in American society after Trump’s victory, but there have been many others since then. However, despite the massive opposition to Bolsonaro, polls show his victory to be likely. Young people compose about 60% of Bolsonaro’s followers, admiring his unconventionality and his critique of the past administration under Dilma Rousseff which sent Brazil into its deepest recession, ultimately leading to her impeachment, and damaging the integrity and credibility of her Workers’ Party. Bolsonaro will be facing former education minister and São Paulo mayor Fernando Haddad of the Workers’ Party in the run-off elections on October 28. One of our society’s most privileged pastimes involves the outstanding and relentless defense of the Constitution as the founding principles of this nation, unwavering in its authority, and righteous in its demand for justice for all. Justice, however, is capable of taking on many different forms. The First Amendment of the Constitution deals primarily with protecting free expression, asserting that “Congress shall make no law… abridging the freedom of speech, or of the press; or the right of the people peaceably to assemble” but these protections offer little nuance when discussing more radicalized forms of hate speech. Historical precedent clearly shows the institutionalized protections on hate speech, from Supreme Court affirmations on public displays of burning crosses in Virginia v. Black as well as R.A.V. v. City of St. Paul, claiming that the First Amendment “prevents government from punishing speech and expressive conduct because it disapproves of the ideas expressed.” The law of the land consistently takes priority over preventative measures against the development of a hostile social environment, one in which hate speech is able to embolden its base of listeners towards stronger inclinations of division and intolerance. This ongoing debate regarding the boundaries of free speech manifests itself within institutions of higher education, particularly American universities that grapple with ensuring free and open civil dialogue alongside cultural tolerance and inclusivity. First Amendment protection often conflict with University mission statements that claim to uphold diversity as a core value, as hate speech excludes and further marginalizes communities based on discriminatory biases. Hate speech takes on many forms, from verbal slurs and edgy jokes toeing the boundaries of racism, to the defacement of property and utilizing symbols such as swastikas or Confederate flags to convey a message of intimidation towards the groups that have historically been targeted by those symbolized movements. Victims of hate speech experience a trauma that extends long after the time of the incident, as William Kaplin writes in Racial Harassment on Campus, “feelings of vulnerability, insecurity, and alienation that repeated incidents of hate speech engender in the victimized groups may undermine the conditions necessary to constructive dialogue on campus” (519). Dealing specifically with college campuses, however, the Supreme Court has declared academic communities to be “special environments” that highlight the nuance of total freedoms of expression, that “although First Amendment principles do apply with full force to the campus, their application may be affected by the unique interests of academic communities” (Kaplin 521). We can look to precedent established by lower court cases on campus hate speech, such as Doe v. University of Michigan which declared that a campus policy prohibiting discriminatory speech and harassment violated constitutional rights to free speech, with a similar case replicated in UWM Post v. Board of Regents, and even going so far as to protect fraternity members dressing in racially charged drag costumes in Iota Xi Chapter of Sigma Chi Fraternity v. George Mason University. These cases divulge the larger question at hand in this paper, leading us to a thesis that challenges the status quo of institutionalized freedoms on university grounds. Allowing hate speech to develop and spread in public discourse directly contradicts the cultural values that Universities implement to foster a safe space for the expression of ideas. The intellectual realms of freedom of speech and diversity of thought disproportionately impact communities of color with cultural histories steeped in discrimination and prejudice. The lessons we learn from legal precedent fall firmly on the line of established jurisprudence without much room for flexibility amidst a rapidly evolving political climate. There is often little to no discussion on the ramifications that these acts of intolerance and prejudice have on the very communities that they target. Any potential consideration for the safety or security of these marginalized communities is outweighed by a blind commitment to First Amendment rights that contribute to the creation of a hostile environment on campus. Universities will not make exceptions for limiting freedoms of speech, which then invalidates any claim made in mission statements to preserve the importance of diversity and equity. There cannot exist a genuine dedication to reforming institutionalized bias and discrimination affecting marginalized student experiences without acknowledging the detrimental impacts of boundless freedoms of speech on these communities. Freedoms of speech ultimately protect a superior class’ right to discriminate, intimidate, and provoke hateful behavior, all while influencing receptive observers to embrace intolerance out of a fear of persecution by liberal agendas of University academia. Harriot’s critique highlights the motivations of white men in positions of power, historically the most severe perpetrators of bias and discrimination, and how these motivations can project themselves within the bubble of campus life. It is a difficult discussion to facilitate, given the clash of interests between cemented legal precedent on protections of speech and the influence of fluid campus policies that appeal to broad, often abstract conceptions of diversity and equity. We as a society may never conclude this debate with a satisfactory answer that would prove effective enough in addressing every facet of the conversation surrounding the extent of freedom of speech protections at the expense of minority communities on college campuses. However, it is important now more than ever for students on every college campus to seriously reflect on the guiding principles of their institutions, and decide whether or not collective action and advocacy is required to bring to light such issues of prejudiced campus policies in hopes of reform. Should First Amendment rights continue to be extended towards students that wish to perpetrate discriminatory rhetoric and behaviors into campus discourse? Despite the fact that hate speech may be perceived as being restricted to verbal epithets and provocative dialogue, there is no denying the vast influence of such dialogue in radicalizing a base that is predisposed to notions of conservatism and white supremacy. When given a venue for right-wing extremism to foster and be accepted into the collective discourse, we legitimize the pining of the forgotten white male, dripping in all his various societal privileges, and we further legitimize his antagonism towards minority communities that he sees as having attacked his historically superior authority over the world and all its resources. When we validate the argument for a diversity of thought, therein lies the potential for serious, dangerous repercussions to arise. As it stands, diversity of thought often goes unchallenged by the neo-liberal consensus that supports a vibrant discussion of differing perspectives, one that respects each side choosing to engage in a rational debate that ultimately serves to uncover the underlying truths and issues of any situation. Some groups and ideologues should not be extended that same level of protection and civility. Groups that don’t have any meaningful contributions to the intellectual sphere of thought, Nazi Party remnants for example, should not be freely welcomed into that space solely to spout hateful rhetoric and incite violence against classes of people. Academic freedoms allow professors to clearly judge the merit of ideas presented in assignments, constrained within a particular field of study, as there exists a mutual set of expectations for the caliber of the work performed in such an academic environment. The same should ring true for freedoms of speech, where the content of student speech may be judged on the basis of its intention to discriminate, intimidate, or threaten against any particular subset of groups vulnerable to the hostility of Constitutional protections. We would be remiss if we did not also note the influence of our nation’s violent foundations of indigenous genocide as well as the founding fathers’ intended primary beneficiaries of Constitutional protections at the time of its conception: white male landowners. The evolution of such hate speech manifests itself into larger public demonstrations where just one spark can set off a powder keg of energy, prompting acts of racially motivated violence to occur and threaten the safety and well-being of individuals. Last summer, a white supremacist rally organized by far-right group Unite the Right in Charlottesville, Virginia quickly devolved into a deadly battle involving many physical altercations and a driver who rode directly into a crowd of counter-demonstrators. The President of the United States, instead of offering words of solace and condemning the violent hate crimes at Charlottesville that day, chose to spread the blame to both sides, further humanizing the white supremacists that came to protest the removal of Confederate statues as “very fine people”. To remain neutral in such instances of oppression and wide-scale injustice is to take the side of the oppressor. When a University administrator does not actively condemn the early roots of supremacist ideals through hate speech, then they endanger the lives of marginalized students on campus that do not have in their possession any form of institutionalized protections. When the University of Southern California’s Provost Quick releases a memorandum that protects the freedom of speech of a known white supremacist student who was involved in the Charlottesville riots, the entire administration participates in the invalidation of minority students by stripping away any ounce of security or dignity that once belonged to them under the guise of a campus commitment to diversity and equity. Ultimately, the argument in favor of blanket protections for hate speech under the First Amendment is not justifiable nor is it responsible to uphold on college campuses that promise a space for its students to learn, grow, and thrive in every aspect. The promiscuity of unrestricted speech threatens an inclusive academic environment, placing a disproportionate target on marginalized communities that hate speech “silences both physically, through intimidation and threats of further harassment or actual violence, and spiritually, by demoralizing its victims” (Ma 703). There cannot exist an expectation for open and civil dialogue to occur when one side is empowered in their desire to exert superiority while the victims are further oppressed in a cyclic and harmful model that only serves to solidify 18th-century ideals in a 21st-century society while learning nothing from our national history rooted in violent discrimination and racial injustice. Gould, Jon B. “The Precedent That Wasn’t: College Hate Speech Codes and the Two Faces of Legal Compliance.” Law & Society Review, vol. 35, no. 2, 2001, pp. 345–392. JSTOR, JSTOR, www.jstor.org/stable/3185406. Juhan, S. Cagle. “FREE SPEECH, HATE SPEECH, AND THE HOSTILE SPEECH ENVIRONMENT.” Virginia Law Review, vol. 98, no. 7, 2012, pp. 1577–1619. JSTOR, JSTOR, www.jstor.org/stable/23333530. Kaplin, William A. “A Proposed Process for Managing the First Amendment Aspects of Campus Hate Speech.” The Journal of Higher Education, vol. 63, no. 5, 1992, pp. 517–538. JSTOR, JSTOR, www.jstor.org/stable/1982092. Ma, Alice K. “Campus Hate Speech Codes: Affirmative Action in the Allocation of Speech Rights.” California Law Review, vol. 83, no. 2, 1995, pp. 693–732. JSTOR, JSTOR, www.jstor.org/stable/3480951. Noorani, A. G. “Hate Speech and Free Speech.” Economic and Political Weekly, vol. 27, no. 46, 1992, pp. 2456–2456. JSTOR, JSTOR, www.jstor.org/stable/4399116. Voters in the Golden State will be casting their ballots on November 6 for a litany of both congressional and statewide seats, one of which will determine the course of leadership for California’s Department of Education. The State Superintendent is responsible for this leadership of the Department, executing Board of Education policies, as well as managing school districts, after school programs, summer programs, and career and college readiness programs. Yesterday, I had the privilege of attending a Public Policy forum hosted by Southern California Grantmakers, a regional association of philanthropists and grantmakers working to make a difference in our communities and around the world. This event was attended by a myriad of influential donors and grantmakers in the nonprofit world, representing different types of foundations ranging from private to community, as well as some government agencies. A forum was held Monday night to provide members with an intimate opportunity to hear from the candidates running for the highest statewide elected office for education, the State Superintendent of Public Instruction. The conversation was moderated by Cara Esposito, Board Member of Southern California Grantmakers and Executive Director of the Leonetti/O’Connell Family Foundation, and involved a conversation solely with candidate Marshall Tuck since his opponent, Tony Thurmond, declined the invitation to participate. Grantmakers asked Marshall what his top 3 goals were for education, and he responded with “increasing post-secondary and college completion rates, improving college readiness, and bridging achievement gaps” as part of a broader effort to strengthen equity for all students. A strong believer in universal pre-K, he wants to divert the state’s exorbitant funding from its criminal justice system into education, as well as exploring other sources of revenue that could be used to increase teacher and principal compensation and fund classroom resources. Tuck believes that California’s data systems are woefully lacking, and that major steps must be taken to track students more effectively all the way through to the workforce. A significant aspect of Tuck’s educational ideology revolves around equity, addressing the disproportionate levels of support in place for students of varying socioeconomic, racial, and ethnic demographics. He recognizes the disparity in teacher quality, facilities, funding, resources, and more that contribute to gaps in academic achievement largely affecting low-income students of color. He claims that “the middle and upper class have never been stuck in poorly performing schools”, an important distinction to make when reforming the education system to properly serve its most vulnerable populations. Marshall Tuck brings 15 years of experience in public school administration to the race, most notably his executive leadership of another nonprofit known as the Partnership for Los Angeles, a collaborative venture between philanthropy and the public sector to improve student performances in struggling K-12 schools. Tuck and the Partnership successfully raised four-year graduation rates by 60% and had the highest academic improvement among California’s schools systems with more than 10,000 students. 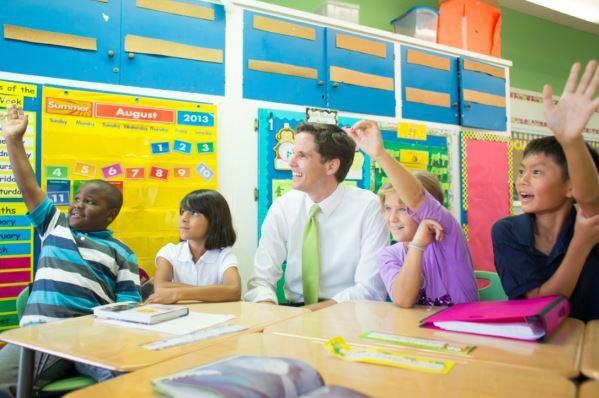 Prior to the Partnership, Tuck served as the President of Green Dot Public Schools, where he helped create 10 new public charter highschools in LA’s most disadvantaged neighborhoods. Green Dot’s major success involved developing a foundation of high academic performance for students of color in low-income communities, a marginalized population that often falls through the cracks of the achievement gap in our education system. If you ask a representative sample of voters if they know the name of the current Superintendent, it is likely that a majority of them will have not even heard of the position itself. This is incredibly problematic when recognizing the scale of the impact that the State Superintendent can have on statewide education policy, especially with California’s influence as a progressive economic power on the rest of the nation. It is unacceptable for California’s representatives to claim that we are progressive when we are failing our most vulnerable populations of young students, providing inequitable and unsatisfactory preparation for their future pursuits in academic and professional fields. U.S. News ranked California’s pre-K through 12 education performance at a dismal 44th in the nation, measuring the impact of our schools through statewide test scores and public high school graduation rates. Can we afford to continue with the status quo, as California is dropping lower and lower in national education rankings by the year? Or is it time that we explore avenues for reform, transforming the way we think of traditional educational standards by challenging the norms that have changed little from the times of the Industrial Revolution? We must move past political battles and instead spend more energy addressing educational inequities facing our students, teachers, and community stakeholders, identifying gaps in curriculum and support services to improve success rates and college readiness.